Summer time is braai time and there is usually a leftover steak that is slowly devoured in little chunks over the afternoon or next day. Here is a great way to turn that left over steak into a complete and very delicious summer meal. It’s so simple and the dressing is fantastic. (2 people) feel free to double or triple this recipe. First do the potatoes, add a glug of oil and the butter to a pan on a medium heat, add the poatato cubes and fru until golden brown, tossing and separating them from time to time. (They have a tendency to stick together). Remove and drain on absorbent paper. Slice your steak across the grain into thin slices about 1/2cm thick. Now make the dressing by adding all of the ingredients to a small pot over a low heat and whisk furiously until the sugar has dissolves. 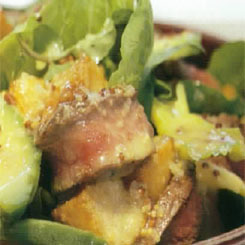 Add your greens, avocado, crunchy potato cubes and steak to a bowl, toss it and then drizzle over the dressing. It is really good with both hot and cold steak. 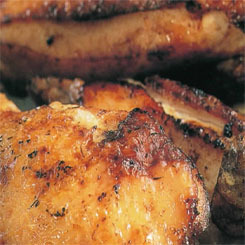 I have also make it with barbecue chicken breasts sliced up and it is sublime. Take each chicken portion and with a sharp knife cut 3 slashes into the flesh almost to the bone. 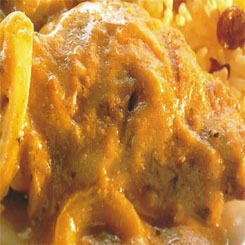 In a large bowl add the yoghurt and curry paste, mix well and then toss in the chicken pieces. Mix them around to ensure that each piece is well covered. Cover with cling film and allow to marinate for at least 1 hour in the fridge. Add the cumin, ginger and chili flakes and toss around for about 2 minutes. Now add your chicken pieces and cook them for about 10 minutes or so until browned all over. Add whatever marinate is left over, add a dash of water (about 50ml or so), mix, reduce the heat to medium low, cover the pan and let it simmer for 15 minutes until chicken is cooked through. That’s that, and here is the yellow rice recipe. Add the butter, icing sugar and vanilla essence to a bowl and beat well until smooth. Add the chopped pecan nuts and sift in the flour. Stir to combine and then roll teaspoon size balls with your hands and place them on a greased and lined baking tray, leaving about a 3cm gap all around to allow for spreading. 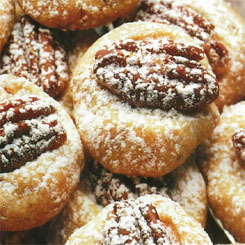 Place a whole pecan on top of each ball and press down lightly, don’t flatten them, they will spread during baking. Bake in a 180 Celsius oven for 15minutes or so until lightly browned. Remove from the oven and allow them to cool and crisp up. Give them a dusting with sifted icing sugar. That’s that, you have foolproof pecan cookies. Here is a chocolate pecan cookie recipe for you to try as well. The holidays always remind me of the times spent on the Natal North coast and the local shop that always had coconut ice and peach sherbet in these huge glass jars. 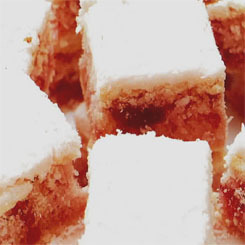 Here is a really fancy version of coconut ice layered into these delicious slices and toped with icing. These are incredibly sweet but so delicious. The kids will love making these… and if you can get them to sell a few for some holiday pocket money, al the better. Take a baking tray and lightly grease with butter, then cover with wax paper. In a mixing bowl, combine the butter, vanilla essence, caster sugar and egg yolk and beat it until it is smooth and well combined. Sift in the flour and maizena, then add the coconut and stir to combine. Lightly flour a surface and knead the dough for a minute or two until smooth. Separate into 2 portions and set aside. In a pot over a very low heat add the caster sugar and butter and combine, then add 1 tablespoon of milk and mix until it is thick but easy to spread. You may need a little extra milk, but see how it feels first. Press it down lightly and trim the edges with a knife. Place in a 160 Celsius oven for about 30 minutes until the top begins to brown. Remove from oven and allow to cool, then spread a layer of the icing over the top, sprinkle with coconut and leave to cool completely. When it’s completely cooled, cut into squares with a sharp knife. This Christmas pudding recipe really needs a scale, I have tried to get it to cups but depending on the size of some of the ingredients, whether they are chopped or not etc… just does not do it justice. Head on over to the appliances section and get one, they are not expensive and once you have one you will wonder how you did without it. 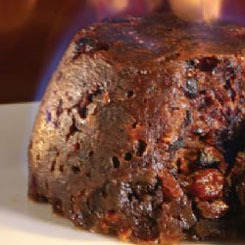 You should make your Christmas puddings now for Christmas, just like a good Christmas cake, a Christmas pudding needs some time for all of the flavours to combine and the alcohol to really make a difference. Some say you should make them as far as 3 months ahead but not really necessary. You can also make it a week or so before but giving it time does make a difference. It’s an old fashioned recipe that has suet in it which you can get from your butcher, you just need to ask for it. You can use Brandy or Rum. Makes 2 small ones or 1 large one. Take either 2 small glass bowls (600ml or so) or 1 larger glass mixing bowl (1200 to 1500ml) and lightly butter them inside. Use a piece of the butter wrapper, it’s easiest. Combine everything except the Brandy and eggs in a large mixing bowl and mix with a wooden spoon to distribute evenly. Now add the Brandy and the eggs and give it a good mix. Fill the bowls equally with mixture and then cover tightly with tin foil by laying a piece over the top and creating a thick edge with the foil that hangs over the edge. Now take the largest pot you have, place a saucer upside down on the base, place the pudding on the saucer and pour water around the side to reach about 2/3 up the side of the pudding and bring to the boil. When it’s boiling reduce heat to a simmer, place the lid on and it needs to steam for 5 hours. Important: Check every 15 to 30 minutes depending on the size of your pot and top up the water level. Remove from the heat and allow it to cool before yuo remove it. Once cooled and out of the pot, cover it with a fresh piece of foil and set it on a shelf in a cool dry place until you are ready to eat. To reheat, steam in the same way for an hour, place a plate over the top and then turn upside down allowing the pudding to settle on the plate. Pour about 2 tablespoons of brandy over the top and set it alight. merry Christmas. It’s very rich and this will happily serve 6 to 8 people with custard and perhaps one of these strawberry cream cakes. Here are all the rest of the Christmas recipes you will need. First you want to toast the pine nuts by placing a pan on a medium to high heat, adding the pine nuts and letting them toast. Toss them around until they begin to brown and there is a beautiful aroma in the kitchen. remove them and set aside. In a large pot add the cream, the whole tin of tomatoes with all of its juice and the garlic and bring it to the boil, then reduce the heat to low and simmer for about 4 or 5 minutes allowing some of the fluid to evaporate. It will begin to thicken and you know that this is the time to add the sund dried tomatoes and olives. Let it simmer for another 2 or 3 mintes to heat everything through. Taste it at this stage and season with salt and pepper. 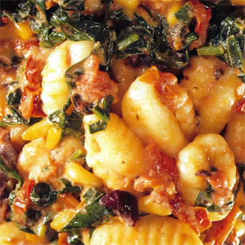 Now add the cooked gnocchi, the spinach and the pine nuts to the sauce and allow to simmer until the spinach has wilted and heated through. That is that, a fantastic Italian meal. 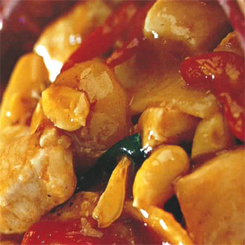 if you are using chicken in your dish, add cooked chicken that has been lightly salted with the sun dried tomatoes. In a pan on a medium heat, add about 2 heaped tablespoons of butter and a splash of olive oil until foamy. Place the crayfish flesh side down and cook until you begin to get browning and caramelizing on the flesh. It should take no longer than 3 or 4 minutes. Add the lemon rind, garlic, and lemon juice to the pan, give it a good shake around and then turn the crayfish over, place a lid on the pan and allow to steam for about another 4 or 5 minutes. The flesh should be white and quite firm. Place 2 halves on each plate, spoon over a bit of the sauce and serve with lemon wedges and a little grind of salt and black pepper. A nice fresh but simple salad with a few croutons is ideal for this recipe. 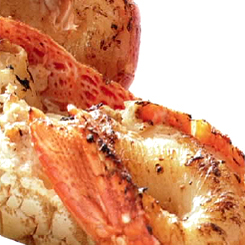 try these prawns kebabs for your summer braais. Kofta Indian style with a rich tomato and yogurt sauce is just so morish your family will be wiping the bowl with whatever Naan bread is left over. Kofta is really a Greek dish but most countries do something like Kofta with various sauces and ingredients like this Kofta on skewers which is a very easy to make recipe that tastes fantastic. This dish is more about the sauce which takes a while and needs a lot of ingredients, so visit your local deli or Indian food store first. For the real flavor of this sauce you will need the seeds, so go out and buy them. First we make the Kofta balls. Grate the onion and place it in a colander, now press it firmly with a spoon and drain out some of the liquid. 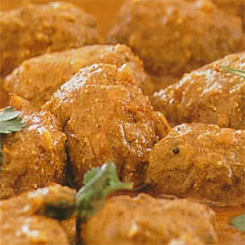 Add all the rest of the kofta ingredients to the onion in a bowl and mix together with your hands very well. Really get in there and squeeze the mixture to combine all of the flavors. Now make about 20 to 24 equal size balls, you want to form them nice and firm. Place on a plate, cover with cling film and into the fridge while you make the sauce. For the sauce, the first thin is to roast the seeds. Place a pan on the stove on a hot heat and add the coriander and cumin seeds. Toss them around until the begin popping and the smells coming off the pan are filling the kitchen. remove and place in a pestle and mortar and grind to a fine powder. Now add all of the rest of the ingredients except the tomatoes and yogurt to a pan on a low heat. Cook slowly until the onions are transparent and quite soft, add the ground cumin and coriander seeds and cook for a further 2 minutes or so stirring constantly. You should be salivating at this stage. Now add the tomatoes and heat through. Now add the yogurt and, mix quickly and add the kofta balls. Turn up the heat and bring to the boil. Immediately reduce again to low heat and simmer uncovered for 1 hour, stirring from time to time. You may find that you need to add a little water during the simmer but not more than 1/2 a cup added as needed. It’s seriously tasty this, so take a chance and give it a try. Naan bread is a must for this recipe.